Legal Retrieval Services, Inc. can perform any Federal, State, or County court filing where the Case Management/Electronic Case Filing (CM/ECF) requirement is not applicable. We perform non-CM/ECF filing types at any Federal, State, or County court located in the New York / New Jersey Metropolitan region, and always on an immediate (SAME-DAY / SUPER RUSH) basis. Stamp copies (proof of filing) are either emailed or delivered to clients instantaneously after the requisite filing has been successfully completed. Legal Retrieval Services, Inc. can perform document retrievals at any Federal, State, or County court located in the New York / New Jersey Metropolitan region, and always on an immediate (SAME-DAY / SUPER RUSH) basis. We are experts at file research, document investigation, and procurement. If requisite documents are lost from a file, we find them. If requisite documents are not available, we get them. 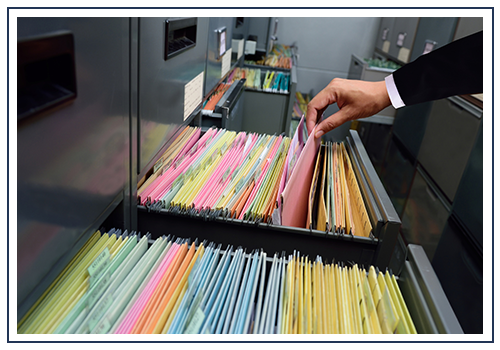 We order and diligently follow up on files that need to be ordered from “Court Archive” facilities. Retrieved documents are either scanned and sent to clients immediately upon retrieval, delivered to clients same day from completion of retrieval request, or shipped same-day to clients using any shipping method clients prefer. Our SAME-DAY / SUPER RUSH document retrieval service has significant value to clients when their retrieval requirement has to be performed at a court located in a state, city, or county that is considered too far away. Such requests are never an issue with Legal Retrieval Services, Inc. We have the unique capacity to retrieve documents from any court located anywhere in the United States. Requested documents are emailed to clients same-day, or if requested files are too large for emailing procedures, then requested files will be overnighted to clients for next-day delivery. We are the most dependable service in existence for requisite calendar submissions. When clients need their responses to be submitted on a particular return date (“calendar”), Legal Retrieval Services is the perfect surrogate to hand-up reply documents (motions, etc.) at any designated court, both timely and accurately. Clients receive a confirmation directly (either by phone or email) from our calendar submission associate immediately after the requisite calendar papers are successfully submitted. Stamp copies of submitted documents are provided back to clients from courts that provide such stamp copies. Using our court calendar service allows clients to be more resourceful with their staff personnel, as it is quite costly and time-consuming to have law firm clerks wait for their papers to be processed at calendars, which are usually enduring and tedious. Our very knowledgeable and highly experienced Legal Retrieval Services staff personnel will follow through with all requisite projects and provide clients with comprehensive status reports (with updates) every step of the way until such project requirements are successfully completed. Call us today to inquire about our court services.